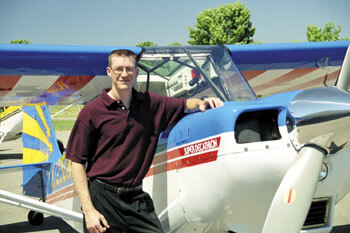 Mike Hunter was told that he would never be able to fly after he was diagnosed as an Insulin Dependent Diabetic. In 1998 the FAA began granting special issuance medicals for insulin-dependent diabetics who demonstrate excellent control of their condition. This gave Mike the motivation he needed to control his diabetes. Mike now monitors his diabetes as required FAA regulations require. Insulin Dependent Diabetics must carry a blood glucose monitor and glucose tablets with them at all times while in flight. 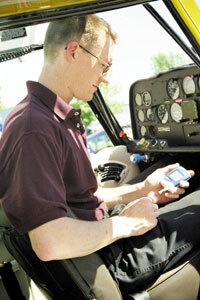 They must check their blood glucose level before each flight and at specific intervals during the flight. If the readings are not within a safe range they must eat must eat a quick acting glucose tablet to raise their blood sugar level or land at the nearest airport. They must see a specialist every three months and report any problems with the disease to the FAA. Mike flys an American Champion Aircraft 180hp Super Decathlon and applauds the FAA’s decision to approve Insulin Dependent Diabetics. Mike believes that the technology and knowledge that diabetics today have at their disposal allows them to be safe pilots as long as they have their disease under control and follow the some common sense rules. Hundreds of Insulin-Dependent Diabetics have been granted 3rd class medicals by the FAA.